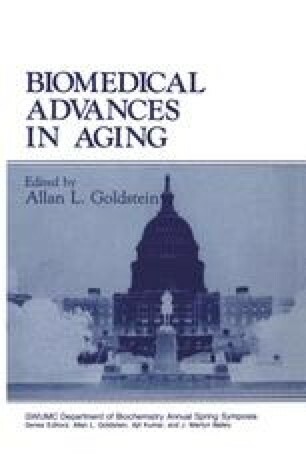 The ability of aged rodents and humans to respond to foreign antigenic challenge decreases with age (Makinodan, 1977; Gottesman, 1987). This age-related deficiency is particularly severe in the T-cell system, as evidenced by the involution of the thymus, the decline in T- proliferative response to mitogens and specific antigens (Meredith and Walford, 1977; Miller and Stutman, 1981), the defeat in the ability to generate specific T-suppressor cells (Gottesman et al., 1984; Yin et al., 1988), and the inability of T cells to provide help for antibody production and cell-mediated immune responses (Miller and Stutman, 1981; Zharhary et al., 1984). Although many of these defects are contributed to by reduced lymphokine production by cells from aged donors (Miller and Stutman, 1981; Thoman and Weigle, 1982; Chang et al., 1982; Gilman et al., 1982), these activities are not all totally restored by addition of exogenous lymphokines (Gottesman et al., 1985). Cytotoxic T-lymphocyte (CTL) activity, a vital function for survival of the organism, shows an age-related decrease when assayed in bulk cultures (Gottesman et al., 1981). Limiting dilution analysis show a deficiency in a proportion of aged mice tested in CTL precursor frequency, under conditions in which helper cell function and interleukin-2 (IL-2) production are not limiting (Miller, 1984; Gorczynski and Chang, 1984; Zharhary et al., 1984).